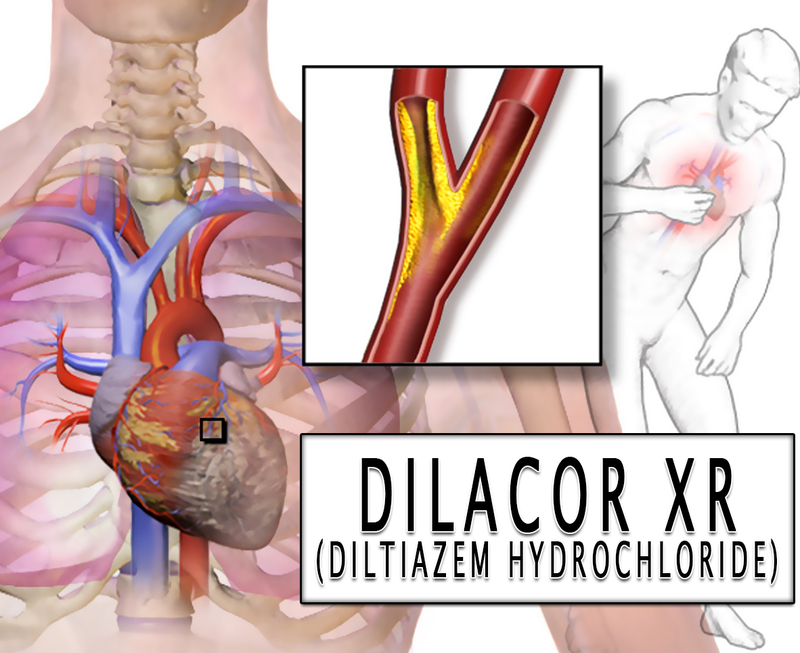 Dilacor XR (Diltiazem Hydrochloride) is used to treat severe chest pain (angina) or high blood pressure (hypertension). This is used alone or together with other medications. High blood pressure adds to the workload of the heart and arteries. If it continues, the heart and arteries may not function well. This can harm the blood vessels of the heart, brain, and kidneys. It may result in heart failure, stroke, or kidney failure. High blood pressure may also increase the risk of heart attacks. These problems may be less likely to happen if your blood pressure is controlled. How does Dilacor XR (Diltiazem Hydrochloride) work? Dilacor XR (Diltiazem Hydrochloride) works by affecting the movement of calcium into the cells of the blood vessels and heart. As a result, this drug relaxes the blood vessels. It also increases the supply of blood and oxygen to the heart while lessening its workload. Why use Dilacor XR (Diltiazem Hydrochloride)? Dilacor XR (Diltiazem Hydrochloride) is a calcium channel blocker. This helps to lessen the number and severity of episodes of chest pain from angina. This medication may also help you to increase your ability to exercise. The Food and Drug Administration (FDA) has approved this medication. This is available for oral administration with the strengths of 60mg, 120mg, 180mg, and 240mg. How to use Dilacor XR (Diltiazem Hydrochloride)? This medication is to be taken by mouth with a full glass of water. It is usually taken once daily before breakfast or as directed by your doctor. Swallow it as a whole. You don’t need to break or chew it. Follow your doctor’s prescription carefully. Take it at the same time each day. Your doctor may gradually increase your dose depending on your response to the drug. What are the side-effects of Dilacor XR (Diltiazem Hydrochloride)? This drug may make you dizzy or drowsy. Do not use any machinery or do anything that requires your alertness. If you are pregnant, don’t forget to consult your doctor first. Do not take any other medications while taking Dilacor XR (Diltiazem Hydrochloride). Discuss it with your doctor first. You should not take this drug longer than it is prescribed.